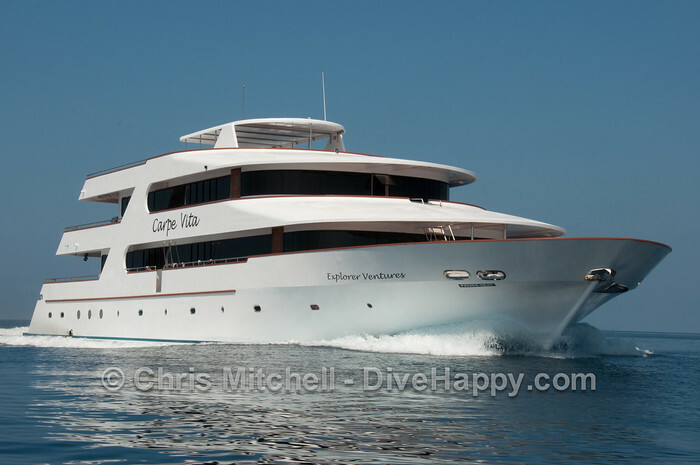 Carpe Vita is a brand new luxury Maldives liveaboard which launched in March 2011. The sister ship to the already established Carpe Diem liveaboard, Carpe Vita is purpose-built for scuba diving. The boat basically aims to take the best elements of Carpe Diem and make it even bigger and better. Carpe Vita is targetted at the luxury end of the dive market and runs 7 day Maldives diving trips departing and returning to Male. If you can’t be bothered to read all of the info below, the executive summary is that Carpe Vita is an excellent boat, very efficiently set up and operated, and is certainly raising the already high bar of what to expect from luxury Maldives liveaboards. 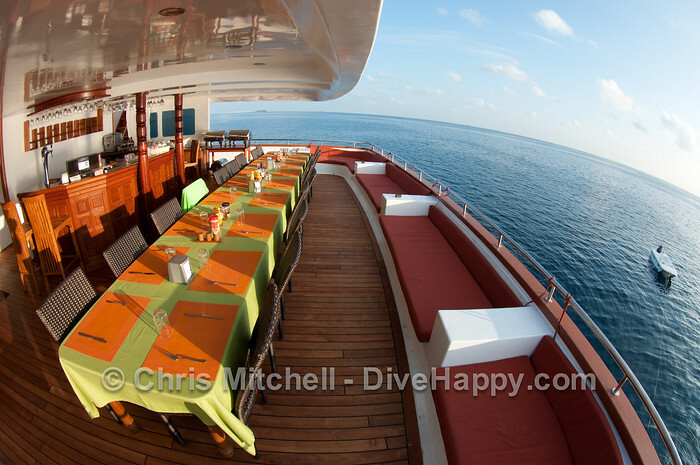 It compares favourably with the two other luxury Maldives liveaboards I’ve been on previously – MV Orion and Sachika. View Carpe Vita liveaboard’s current schedule and pricing for Maldives trips. Carpe Vita’s topside and interior was designed and built by Dutch partner Agnes Van Linden and her father Fop Van Linden in Innamadho shipyard in Raa Atoll during 2010, the first thing that’s noticable about Carpe Vita is the sheer amount of space. 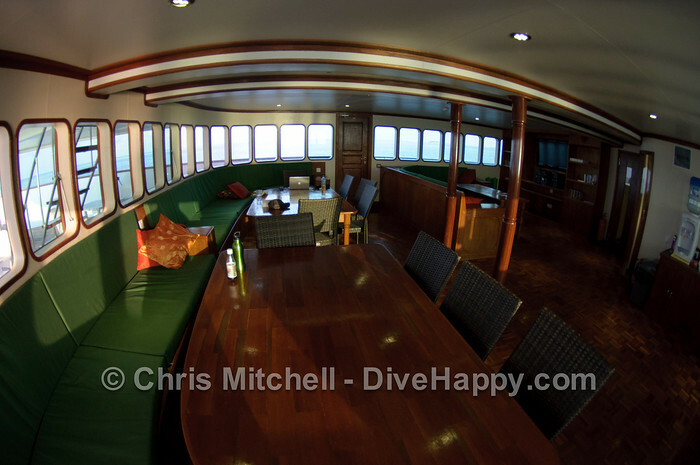 The liveaboard has a maximum of 20 guests, 10 rooms and there is plenty of room to accommodate all of them. The saloon is huge with a snack area and three separate tables and fitted cushioned seating and windows running around the full length of the room which keeps it light and airy. Eating usually happens on the open air upper deck at the back of the boat, where meals are served up buffet style and there are more moulded seats for reclining. 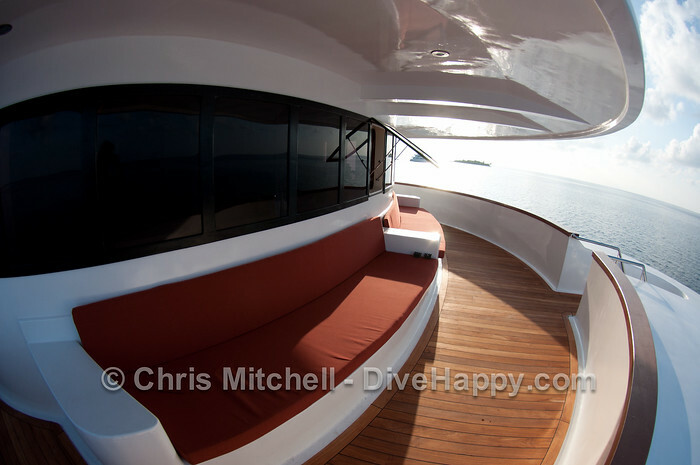 The sundeck at the top of the boat also has a jacuzzi and a good size shade over more seating and sunbeds to accommodate around 10 people at any one time. My favourite area of the boat was at the front on the upper deck where more comfortable seats await – one of the nice things about Carpe Vita is that it feels there are plenty of spaces where you can spend time alone as well as the main communal areas. Each of the bedrooms is big enough to fit a full king size double bed and a single bed together – good for friends and family who need separate beds – and also has a spacious ensuite shower, sink and toilet. 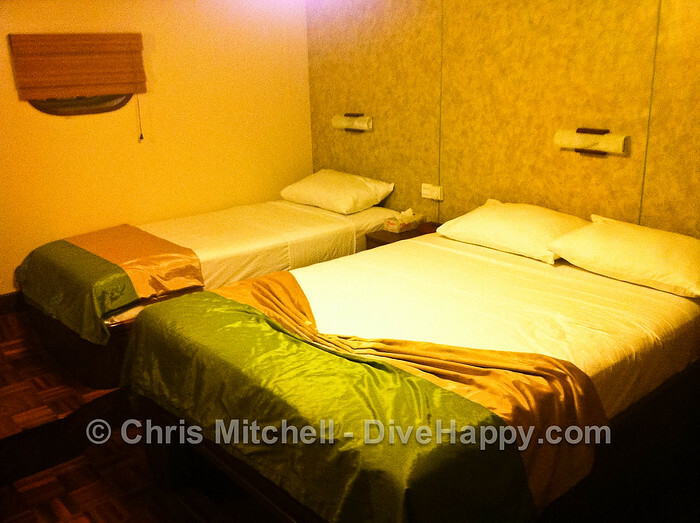 Apart from MSY Damai in Indonesia, these are the biggest rooms I’ve seen on a liveaboard anywhere. The bedrooms also have a single desk for photo editing, several power outlets (standard British 3 pin plug sockets) with power adapters thoughtfully provided, and a flat screen TV to which a media centre can be attached to play back lots of movies. The room has powerful aircon that can be quite arctic if you require it to be so, while the shower has strong water pressure, a good size shower head and dependable hot water. My room had a slight whiff of diesel to it but it was barely noticable after the first night. 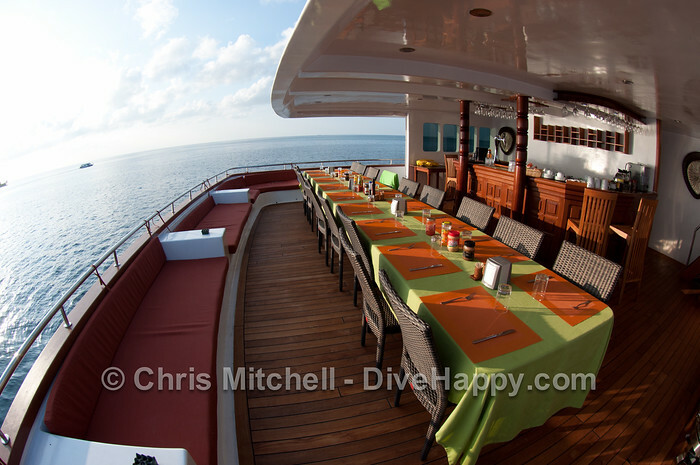 Carpe Vita follows the classic liveaboard pattern of providing generous quantities of food at breakfast, lunch and dinner, with pre-breakfast snacks available before the first dive and snacks late afternoon. There’s a barbeque dinner on a typically picture postcard perfect Maldivian island one night (complete with whale sharks carved in the sand) and a sit down dinner where four courses are served to you on the boat another night. Otherwise, it’s a buffet setup and you help yourself. The food is in general good, although being a bit fussy/overly fond of food I would have liked to have seen a couple more choices of main course. It’s very nice to be able to eat outside each time, and the captain is diligent about positioning the boat so the deck is in the shade. That said, with a full compliment of guests, it does get a bit crowded for moving around the table during mealtimes. Carpe Vita has a very impressive policy of not only providing unlimited free drinking water (important to check this is included when booking Maldives boats) but also two complimentary beers or glasses of wine for each guest each night. 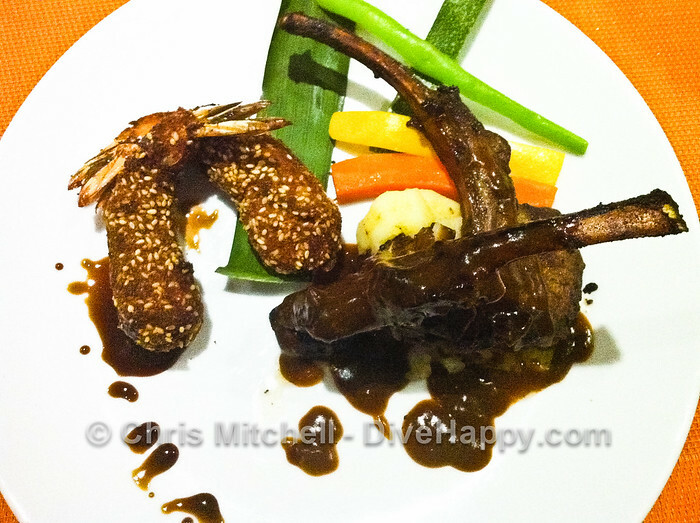 As this is often all most guests want with their dinner, this is a nice bonus – especially as alcohol in the Maldives is not cheap. For those who wish to indulge a little more, there’s a good selection of wine available priced at a reasonable $25 and up, and bottles of spirits (e.g. Stolichnaya Vodka) start at $65 a bottle. The dedicated bar staff are very good at promptly attending to drink orders. You sign for your drinks at the end of each day. 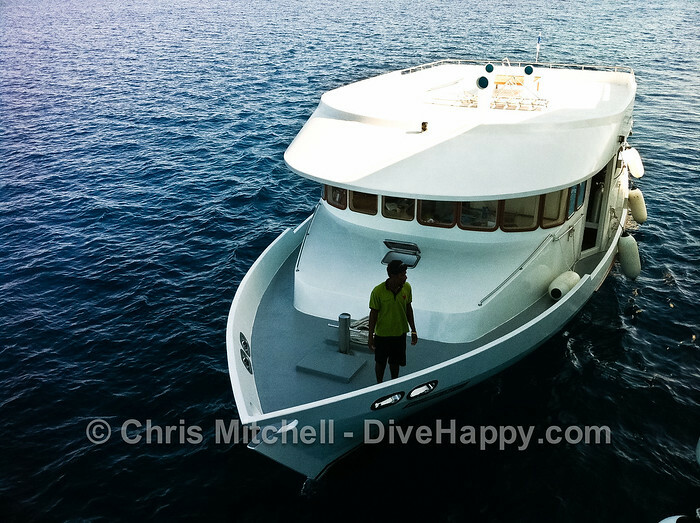 As with other Maldives liveaboards, all diving on Carpe Vita takes place from an auxiliary boat, or dhoni, that follows the Carpe Vita behind. 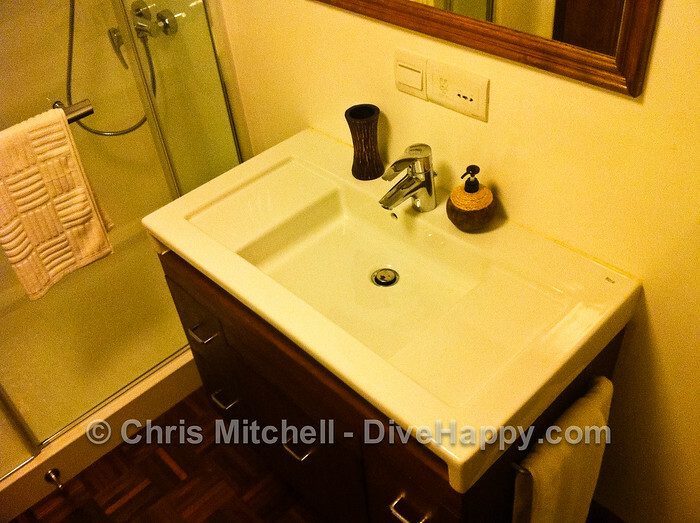 Dhonis are traditional Maldivian boats and so usually quite basic – the Carpe Vita dhoni however is really quite posh, with lots of space (again) for each guest to gear up, two large rinse tanks for cameras, and a large, spacious toilet and shower too, which is a real luxury. (Peculiarly though there doesn’t appear to be a drinking water dispenser on board – this is apparently being rectified very soon). Dive briefs take place in the saloon and there’s a whiteboard in the main lobby area which shows the dive times for each day. A loud bell is rung to indicate a dive briefing is about to take place – if you don’t come to the saloon, it’s assumed you want to skip the dive. There are four dives scheduled each day with the first briefing at around 0630. When there’s no suitable night dive spot there will be a late afternoon dive at around 1630. The dive guides are excellent, both above and below water – they all speak fluent English and also are a friendly bunch – easy to get on with and receptive to any requirements you need. For photographers with big rigs, the setup is adequate but not ideal. 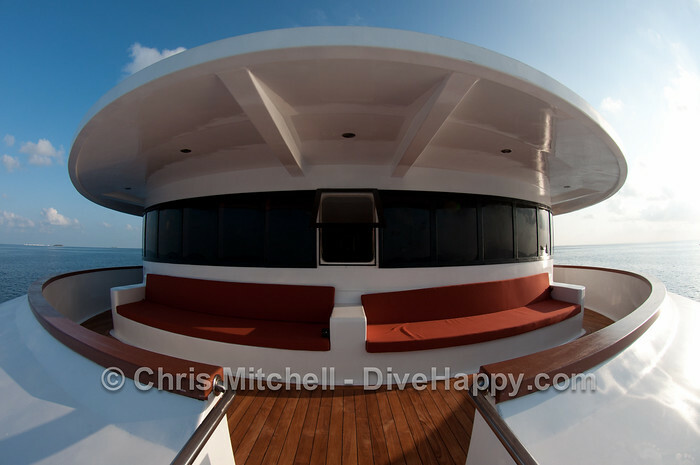 There are rinse tanks on the dhoni and on the back deck of the Carpe Vita itself, along with a table for cameras and a charging station for batteries et al. I would have liked a dedicated area on the dhoni for large cameras to be placed out of the way. The boat staff were very helpful but not quite familiar with how to handle camera gear. The biggest problem is big cameras being left in the rinse tank and other cameras being dropped into the rinse tank on top of the dome of another camera below. If the boat staff could give big cameras a quick rinse and then store them for the journey home it would avoid any unfortunate accidents. The main thought that kept occurring to me during my week on Carpe Vita was that , to coin a phrase, “everything just works”. From the hot showers to the dive briefings to the spacious dhoni, a lot of thought has gone into the details of how the liveaboard should work, clearly inspired by experience learnt whilst managing sister liveaboard Carpe Diem. It’s obviously the beginning of Carpe Vita’s career and stuff on boats always breaks, but the planning that has gone into the boat, and the ongoing revisions to subtly improve their processes over time, means that I’d be surprised if the Carpe Vita’s high standards slip anytime soon. The initial feedback from Carpe Vita’s first guests, mainly American, has been very positive. 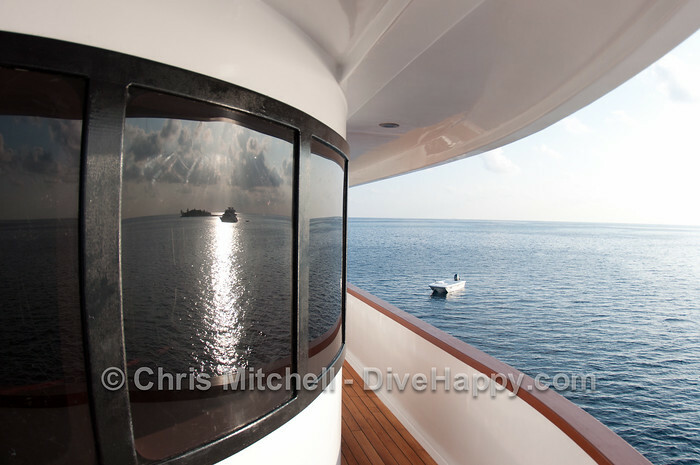 I would have to agree – if you want to maximise your diving in the Maldives and also want a luxury boat experience with plenty of space, Carpe Vita should definitely be on your shortlist.